Headed back home from Heathrow Airport after a lovely vacation, I stopped at the Pret A Manger for a quick pre-flight bite. 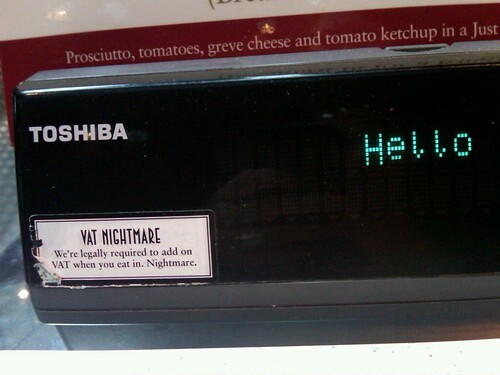 When I got to the cash register, I noticed this awesome sticker — concise, honest, and, best of all, empathetic. VAT when you eat in. Nightmare. They’re legally required to charge VAT (value added tax), but they aren’t required to be dicks about it. Yet most merchants are. The staff feels that it’s out of their control and they’re sick of getting blamed, so they shrug their shoulders and keep it quiet, hoping you won’t notice. I admire Pret for taking a different route: being upfront, noting it prominently, and identifying with the customer. Now that they’ve set my expectations and repudiate the blame, my distaste in paying it doesn’t negatively effect their brand. In fact, I like them even more now. It’s kind of genius. Another good reason to continue spending $$$ money on sea salt popcorn and those freaking amazing brownies. pret-a-manger? i prefer that bagel place. but i do like the sign! The “Nightmare” thing has the opposite effect on me. I think it’s opportunistic & creepy, faux-informal. They’re using this a chance to positively brand themselves in the midst of the policy, agreed – but this kind of hey-we’re-just-like-you approach, the direct personal address that predominates modern marketing is an insult to the part of me that thinks. Yuk!